Proteins can be quantitated multiple ways, and the way you do it really depends on what question you want to answer. That's why we’ve got all the tools you need to help you do it. The Simple Plex assay run on Ella is a fully automated, multi-analyte, mini ELISA that gives you the same specificity of a single-analyte ELISA. Samples are split across isolated microfluidic channels containing analyte-specific, low surface area GNRs (glass nano reactors), so only very low sample volumes are needed. 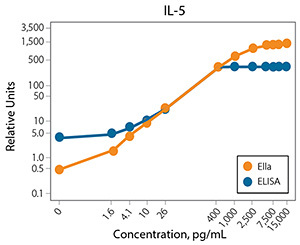 Ella also uses built-in factory standard curves for quantitation. End result? Data that's free of cross-reactivity, with greater sensitivity and a broader dynamic range than you've ever seen with ELISA! With the Simple Western, you can characterize and quantitate specific protein amounts, and you’ll be able to do it in either complex or purified lysate samples. Immunodetection to the protein of interest gives you highly specific identification, and all Simple Western systems run immunodetected standard curves to a known protein standard, so you’ll end up with really quantitative results to boot!